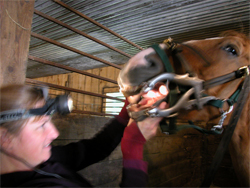 Equine Dentistry - Straight From the Horse's Mouth. Yes, a visit from a veterinarian specializing in equine dentistry is costly but it is important and worth the expense. Here are some great reasons to have your horses teeth checked on a regular basis. A horse can become difficult to manage due to the discomfort of neglected teeth . You then invest money in more training, then a different bit. You finally decide to sell the horse due to its bad temper. All the horse needed was a visit from the dentist. So when you weigh the pros and cons of doing regular dental work for your horse; there are no cons. The expense is worth it. Your horse will live a healthier, longer and happier life with regular dental check-ups. My Quarter horse, Chelsea, was losing weight. I increased her grains but she still continued losing. She had no symptoms of disease and showed no discomfort when chewing hay, although she was taking a little longer to eat it. So, I called Dr. Heather Ross, a veterinarian who is also an equine dentistry specialist. She is also a equine dental specialist. Dr. Ross arrives with her tool box. She washes a giant metal-syringe-like-tool. It is used only to clean out the mouth with water. Like with any dentist, I am apprehensive. First of all Dr. Ross spends time with the horse to relax her and make friends. She then gives her a dental exam. it is just a joke. Horses are not prone to cavities. But if they do get one, the cavity tends to be far advanced and has been caused by a defect. The affected tooth tends to abscess and the tooth has to be removed. Chelsea needs her teeth floated. Floating is done by filing down sharp jagged teeth. This makes chewing more comfortable. Jagged teeth can hinder chewing and cause abrasions within the cheeks. A light sedation is used for Chelsea to make her more comfortable. The Dentist keeps the horse in her stall for the sedation and the dental work. She attaches the speculum to the mouth. It looks like a halter with metal torture instruments attached to it. (Just like any dentist). But it only looks torturous and is used simply to keep her mouth open. Above is a photo of Dr. Ross floating a horse's teeth with a power tool. Dr. Ross recommends NOT using a power tool if the horse is less than 7 or 8 years old. She cautions veterinarians to be very careful with power tools if just out of vet school. "You have to be very strong to use the instruments. It is not only precision required but strength as well to manipulate these giant tools." The above right picture is of a file blade. A file blade is attached to a handle and used in equine dentistry for floating teeth. 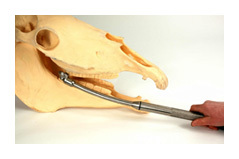 An example of teeth being filed (or floated) is shown clearly on the skeleton head of the horse below. no, she does not use an assistant. She prefers that the owner assists with their horse. Sometimes she has veterinarian student volunteers come with her on her rounds. This helps a student decide what kind specialty they would like to pursue. But, there are jobs out there if you love working with horses. To become a veterinarian Technician you must take a 2-3 year course. But that will not guarantee you a job with horses. Lots of people want to work with horses.  A lb. of carrots a day is enough. More than that can give a horse gas and make it uncomfortable.  Never feed by hand - big horse rule.  Do not use round bales for your horse. They are too big, are left out in the rain and tend to develop mold inside.  Horses can get respiratory problems from moldy hay. Move From Equine Dentistry Back To Equine Health.